For me, I think the 4Kids series ended with Season Four and the conclusion of "Good Genes". I don't believe that a show can radically change directions after four well-received and excellent seasons and survive. You may sell more toys with flashy new characters, but it's just jumping the shark and inevitably losing your established audience. My opinion only, of course, but it does seem fairly inarguable that the show rapidly declined in popularity once Fast Forward happened, and that the same could very well have happened with the anime-styled "Ninja Tribunal". My question is this: If you could have continued the cartoon in the same vein of storytelling as the first four seasons, what would you have done? What comic storylines would you have adapted? What new characters would you have introduced? What conflicts or character developments would you have added? I think the Ninja Tribunal season was a pretty natural direction for the show to take after season 4. The execution, on the other hand, wasn't so great. I really hated the last two episodes of that season. If I had been story editor, I like to think I would have toned down or eliminated all the ridiculous dragon avatar business. I'm honestly baffled how anyone could come to this conclusion since Season 5 was set up entire in Season 4 even prior to the last episode. Well considering Season 4 ends on a cliff hanger episode "Ninja Tribunal" I doubt the 4kids series was designed to end on season 4. But honestly I am shocked Lair green lighted a season like this. 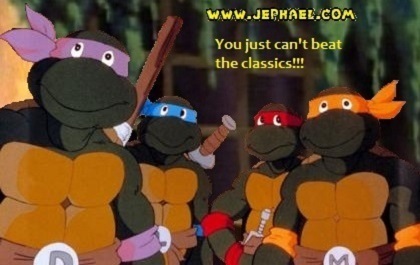 It is so out there as far as TMNT. It is really epic and when I first saw it. I thought hell yeah!!!! Season 5-I would have brought back "Rat King" for the first half of the season and then I would have brought slash and bishop in for the second half of the season. Essentially Bishop would complete his research or hit a mile stone and create his own hybrid turtle. "Slash"
Season 6- I would have gone the IDW route and brought a resurrected Oroku Saki back curtesy of Karia. Couldn't really make sense of your grammar, but I seem to remember it is teased quite a bit through hints and flashbacks like Yoshi's job as an Utrom guardian. Yeah season five was dreadful, but its setup throughout season four was pretty epic and got me hyped, so at least they finished the story. It really wouldn't have been that bad if they toned down the powers and flashy lights... and dragon transformations lol. Also, the acolytes should have either never existed, or never been brought back after their "deaths". No, I mean with the Foot Mystics and them talking about the, "True Shredder" even before the final Season 4 episode. They tell Karai that her father was an, "Utrom abomination" and work with Bishop to free themselves from Karai's control. I also didn't mind the anime/dragon transformations, otherwise the fight with Demon Shredder would have been a carbon copy of Ch'rell. Why can't they use anime powers for a change? It was only for like...3 episodes anyway. I'm with CyberCubed on this. I enjoyed the heck out of the Ninja Tribunal storyarc. I thought it was the best part of the entire series, and it had such an epic conclusion!!! The whole Tribunal and resurrection thing was a tad dull, in my opinion. Given a choice, if the turtles had to contend with an ancient evil over the course of an entire season, I'd have preferred the Necro Monster from the "Darkness Within". Imagine (the much later) TMNT Infestation II comic adapted into 2K3, but greatly expanded. Hell, you can probably keep the Tribunal training, but instead of preparing to face off against old-timey Shredder, the brothers have to deal with a creature (or creatures) who can turn their worst fears or greatest desires against them. More episodes with Utroms, Rat King and jhana, the introduction of characters like complete carnage and radical, cha ocho , etc. That probably would have happened if Season 5 was 26 episodes instead of 12. Had Season 5 gotten a full season order we likely would have seen tons of other stuff in the middle before Shredder returned. I'm not saying Ninja Tribunal was terrible (I personally hated the overdose on mysticism, even though I did love the setup)... I'm saying it was a drastic tonal shift. As was Fast Forward, as was Back to the Sewers. They were gimmicky. I like season 5, and even if some people didn't like it, the medallions they had were gone, so it only lasted 1 season. Had it lasted longer, it might have ruined how the turtles are supposed to be (ninja, not over powered people shooting things and turning into dragons) So it was good to have as a break from the regular stuff. But if for some reason they cancelled it and started from scratch, I would not have wanted them to bring back Utrom shredder (even though he is awesome) and I am not so sure about adding new villains, so I'd like to see the turtles just finish it with the villains form Season 4. Honestly only Back To The Sewers was really disappointing for me. I did find Season 5 weak and the transformation attacks/dragons were the lowest point, but there were still some good episodes like Membership Drive in there. Fast Forward was certainly different and as a child that's when I stopped watching because of that, but looking back at it some things were actually interesting in it. Had they gotten their second FF season they'd have done a Space Usagi episode, which would have been awesome. I think if the Ninja Tribunal had been spread out over 26 episodes instead of condensed to 13 (where only "Membership Drive" was not Tribunal-centric), it would have been more palatable to me. Fast Forward, though, can't be redeemed for me; Cody and Serling both annoyed me. If Fast Forward had been much more aligned towards the post-First Contact world of Mirage Volume 4, I would have liked it. I can see that. I definitely preferred the prior 4 seasons, but that 5 and 6 still had enjoyable moments to them is my point. And while the Tribunal and FF at least took different paths(at times) BttS was a strictly worse version of the first four seasons. Well the true shift in direction ended after season 5. And for me personally that's how it should have ended with the Turtles Forever. FF and BTTS was just extra stuff on the side and it was your choice to view it or not. To me its like when Michael Jordan came back to play with the Wizards. I have absolutely no problem with the fifth season. Honestly, I really enjoyed it. It kinda felt like it could've been a very nice way to wrap up the series. And I really came to love Fast Forward once I finally got to see the fifth season. The only season that I wasn't all that crazy about was the Back To The Sewer season. I'm just glad that BTTS was only 13 out of (what was it) 155 episodes. It got a bit too "mystical" for my tastes, and I didn't care for the "dragon forms" stuff, but a final showdown against the original, once-human Shredder was a decent plot to go out on, and teaming up with their former enemies (with Karai redeeming herself a bit) was a very welcome development. Hamato Yoshi's spirit being the one to kill Saki worked great for me as the capper. I'd have to rewatch it to be sure (and I actually managed to snag a used copy of the DVD for cheap a year or two back), but I remember liking more than I disliked. It definitely deserved better treatment than it got at the time. To me its like when Michael Jordan came back to play with the Wizards.